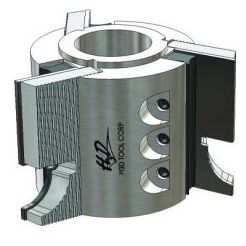 H3D News and Headlines - H3D Tool Corp.
We discovered that many of the consumers purchasing millwork, cabinetry or furniture, do not want the same old off the shelf standard bead or ogee profiles. They want a new look. They want a custom look. And they want it now. 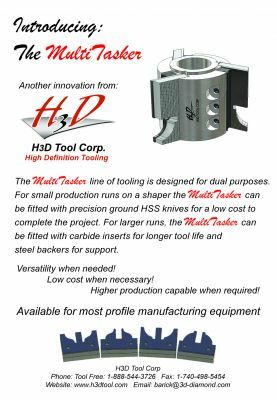 The MultiTasker head will accept easily created high speed steel profile knives typically available in a very short lead time. High Speed Steel is the lowest cost alternative to create new profiles, especially where small or minimal lineal feet are required. This is ideal for single order use, short runs, or unique profiles. The advantage of the MultiTasker is if the order turns in to a big production run or repeat business, the customer can purchase carbide inserts and backers to extend their tool life without purchasing another head! Of course carbide inserts are more expensive and typically a six piece order is required, so this option may be reserved for large projects only.